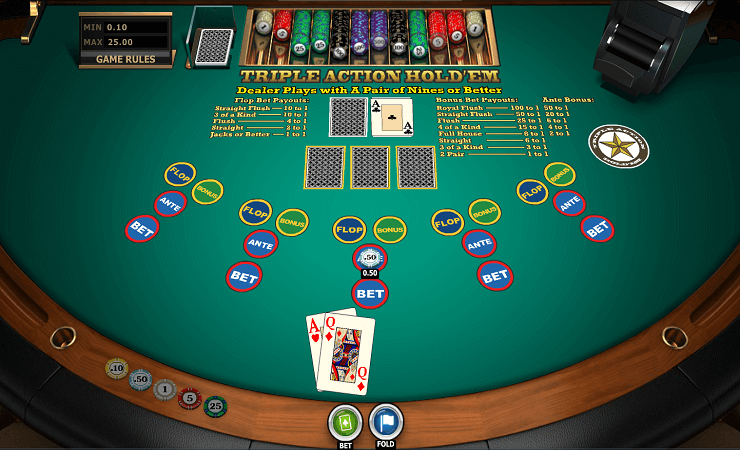 Triple Action Hold’em Poker is based on the classic Texas Hold’em poker, but adds some extra elements to the game, such as side bets and three community cards – hence the name comes from. Four players can play the game at the same time, but the demo version doesn’t support multiplayer. You can play on all of the betting boxes if you want, it is more fun! The interface looks like a poker table and easily understandable. This is a low-stakes game, the maximum bet you can make is 25 coins. 0.10 coin is needed as ante bet to enter the game, and since you get 500 coins in the demo version, you can literally play for hours. Start by placing your bet by clicking on the ante circle, press on the “deal” button afterwards. Both sides will get two cards, and three community cards will get dealt in the middle. One of the dealer’s card is visible, but community cards are non-visible at this point. By pressing on the “bet” button, you can finish the round – community cards will be revealed and the side with the better hand wins the round. If your hand is not good enough, just click on the “fold” button. You will only lose your ante bet and try your luck in another round. Speaking of another round, you can press the “rebet & redeal” button to start one with the same values. To start a completely fresh round, you need to click on the “rebet” button. Bonus bet option requires you to get a specific hand, and pays accordingly. For example, if you make a bonus side bet and get Royal Flush, you will also get paid 200 to 1 in addition to your ante bet. It is based on pure luck, and we recommend putting a coin or two into the bonus bet section – you’ll never know. You can also make flop bets with a payout of 10 to 1, but we recommend sticking with bonus bets only. They have a better payout and you get better odds. Triple Action Hold’em Poker is a nice alternative for players who are trying to learn the basics of the game, it also acts as an introduction for side bets. Highly recommended for all gamblers out there, try your luck with the free version first. 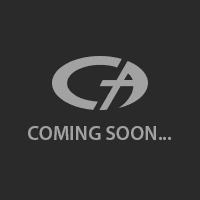 And as always, play at Casino Avenue to find more games suited for your skill level!